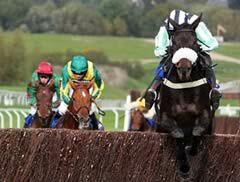 Midnight Chase produced a supreme round of front running to take the Argento Chase at Cheltenham. Neil Mulholland's stable star was recording a fifth win at the track as he adopted his usual front-running tactics and got into a good ryhthm with his jumping. Mulholland has had a dissapointing season, and this was only winner number 12. "We just haven't had the horses. We've had success for a couple of years and a lot are badly handicapped. Him and Dougie get on great together," said the winning trainer. Midnight Chase (9-2) had fallen on his comeback at Down Royal before posting a respectable third in the Rowland Meyrick at Wetherby. He returned to life in the Cotswolds as his neat jumping and relentless galloping put the rest under pressure and with Captain Chris quickly pulled up after hanging alarmingly right over the first few fences, his most likely challengers were 100-30 joint-favourites Time For Rupert and Diamond Harry. But they could only manage respective fourth and fifth after Little Josh faded away, and it was that tricky old customer Tidal Bay who emerged as the danger. Midnight Chase, cajoled by Dougie Costello, has not been known to stop up the final hill before and he still had two and three-quarter lengths in hand when taking the £100,000 event. Mulholland said: "I'm delighted, we've had a bad time so this is great. We just haven't had the horses. We've had success for a couple of years and a lot are badly handicapped. You can take cars apart and change them, but you can't do that with horses. Thankfully Midnight Chase is always there to pull out a performance." The sponsors Betfred cut Midnight Chase to 16-1 for the Gold Cup and Mulholland added: "I thought he was in the same form as a year ago, but he's got stronger and he's very genuine. "He loves racing and he loves Cheltenham, so he has to go for the Gold Cup after that."